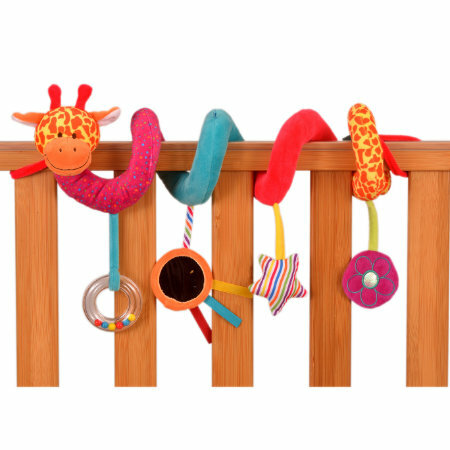 The Giraffe Spiral Toy is the perfect companion to entertain any baby in their cot or buggy! Suitable from birth onwards, the Giraffe Spiral Toy is a sensory interactive toy that will keep babies happy and occupied. Thanks to its special spiral shape, the Giraffe Spiral Toy can be wrapped around the cot or the handle of a buggy which allows it to be easily enjoyed and played with. The Giraffe Spiral Toy can be attached to any cot or buggy by using the soft fabric Velcro straps at each end of the toy, meaning it can be a long term favourite in whatever room or wherever you go!